Welcome to the web page of Jason Schiller. I guess this is where I tell you a little bit about myself. 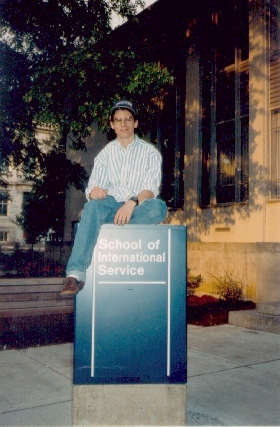 To the left is a picture of me sitting atop the sign for the School of International Service at The American University. This picture was taken in 1995. I guess I like this photo because I was wearing, what was at that time, my favorate hat and shirt. Much has changed since then. The blue signs no longer exist, I have a new hat that I were all the time, and I'm no longer a student. In many ways I define who I am by what I am doing. Take a look and see what I am currently doing.